Because you can never have too many Leos in your collection. 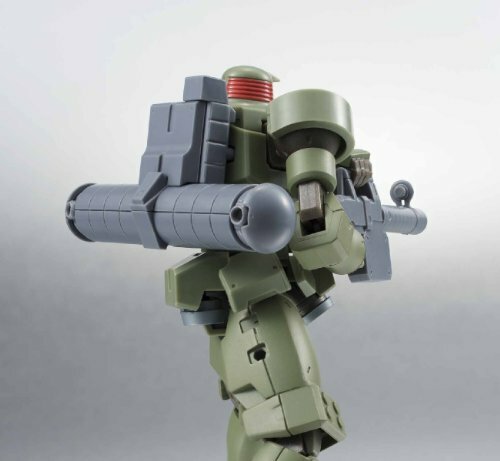 The third moss green Leo Mobile Suit title from the popular Gundam Wing series to join the Robot Spirits advanced robot action figure line-up will be the mass produced Leo as fitted for space. Featuring special issued large cylindrical booster backpack as well as 105mm beam rifle accessories this Robot Spirits release is ideal for posing with multiple Leos. LOOK FOR ORIGIN OF SHIPMENT: Only items shipped from within North America are being sold by authorized U.S. retailers. The product box will have a warning label, which is proof that you are purchasing a collectible action figure or statue that is guaranteed and authentically licensed by Bandai, distributed by its sole and authorized distributor (Bluefin Distribution) exclusively for the U.S. and Canadian markets. This product has been thoroughly tested for safety and meets all North American consumer product safety regulations. The affixed label with the Bluefin Distribution logo also entitles the purchaser to product support assistance.